Disney World's Magic Kingdom has been entertaining crowds since 1971 and the theme park is still as popular as ever. 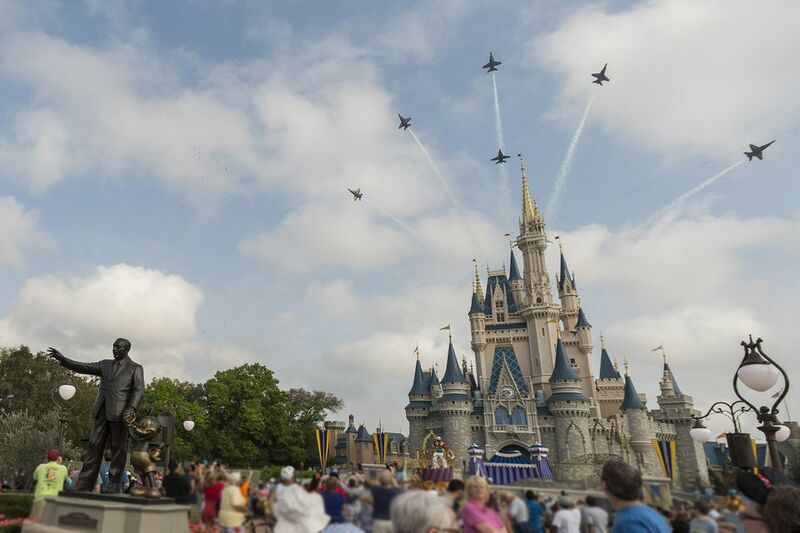 It is the iconic attractions that continue to draw the crowds, making them the top must-see attractions at Disney World's first and foremost theme park. While many of the attractions at Disney's Magic Kingdom are long-running favorites, recent renovations to Fantasyland offers returning guests more Disney World than ever before. It's nearly impossible to see all the attractions at Disney's Magic Kingdom in one day, but make sure your plans include at least one or more of the following top 10 can't-miss attractions. "Yo ho, yo ho, it's a pirate's life for me!" This classic Magic Kingdom ride that launched the movie series showcases Disney's animatronics at its best with ghostly sightings and rowdy pirate pillaging. Fans of the movie series and Jack Sparrow will enjoy searching the attraction's scenes for the spry swashbuckler. After a rather long dungeon queue, guests board a boat for a ride through the pirate-themed attraction. Most of the ride is gentle, but passengers may be caught by surprise during a sudden drop that usually creates a small splash. The Pirates of the Caribbean is the perfect attraction for getting out of the summer heat. It's literally one of the coolest rides in the Magic Kingdom; from the time you step into the pre-show dungeon queue through the end of the ride, you will enjoy relief from the outside temperature. This ride has no height restrictions and is suitable for all ages, but small children may become frightened by some of the scenes. Adults may use the Disney rider switch program to enjoy this attraction without waiting in line more than once. This popular Disney classic ride has received a facelift and a new hands-on interactive queue area. So, if you haven't visited the Haunted Mansion in a while, then it's time! After your trip through the new outdoor queue, and finally escaping a foyer with no windows and doors, you'll board a "doom buggy" for your ride to the other side. Don't worry, the ghosts are lively and friendly, although you may not know whether to laugh at their antics or cry in fear. Either way, you'll safely emerge from the experience with a helpful hitchhiker that is "dying" to go home with you. The sights and sounds you may experience on this ride may be disturbing to some and The Haunted Mansion may be frightening to young children. Parents may take advantage of Disney's rider switch program to enjoy this attraction without additional waiting. Children under 7 must be accompanied by a person age 14 years or older. Disney's recent expansion of Fantasyland has more than doubled the fun of this popular ride that now includes two Dumbo the Flying Elephant rides and a circus-themed pre-ride area that offers guests a cool, relaxing, and fun experience. There are not only slides and nets for children to climb, but also a toddler play area and abundant seating for adults to relax. Children under 7 must be accompanied by a person age 14 years old or older. Obtaining a FastPass+ for this ride will cut down on your wait time. You cannot ride this attraction without humming the catchy tune of "It's a Small World" for the rest of the day. The lyrics of the melody seamlessly brings more than 300 costumed dolls representing more than 100 nations together in five languages to impart the important message that it is indeed a small world. It's a Small World can give guests relief from the hot sun with a covered queue and air-conditioned attraction. Like many other attractions, disabled guests must transfer from their wheelchair or electronic convenience vehicle to board the ride. Other than Cinderella's Castle, Space Mountain is one of the most recognizable attractions on the Magic Kingdom landscape. The out-of-this-world coaster was Disney World's first and is still one of the most thrilling. Guests board a rocket ship and climb to a height of 180-feet before being blasted through the darkness in a series of twists, turns, and drops. It is important that you are in good health to ride this coaster. Those with high blood pressure, heart, back, or neck problems, motion sickness, or other conditions that could be aggravated by sharp motion should not ride. If you're visiting Disney World while pregnant, you should not ride this attraction. This ride may not be suitable for young children. Parents may take advantage of Disney's rider switch program to enjoy this attraction without additional waiting. Due to its popularity, lines are often very long for this attraction. Obtaining a FastPass+ for this ride will cut down on your wait time. Seven Dwarfs Mine Train is one of the newer attractions at Walt Disney World. It's a highly popular ride so get a FastPass+ for Seven Dwarfs Mine Train if you can. If not, do it first thing in the morning or get in line just before the park closes. This attraction has outstanding audio-animatronics. This rollercoaster has portions where riders are in the dark, so it might scare some, but is very smooth and should not bother those with a mild fear of heights. This attraction has a 38-inch height requirement. Another one of Disney's "mountains," Splash Mountain is a log flume ride that features a story from Disney’s Song of the South film. The big finale is a giant drop into the briar patch. This ride is perfect for one of those hot summer days when you want to get wet. This attraction includes 950,000 gallons of water, three dips, and a five-story waterfall. Where you are seated will determine how wet you get (tip: if you're in the front, you'll get soaked). The minimum height is 40-inches. You should use FastPass+ for this or get to it first thing in the morning. Thunder Mountain is a roller coaster themed as a runaway mine train on a ride through the Old West in Frontierland. It's a ride that lasts, too. One of the longest thrill rides at Disney World, at nearly three minutes in length, this ride is actually faster than Space Mountain, but because a lot of it is outdoors, you don't feel it as much. This roller coaster was designed to be thrilling, but not too scary that adventurous younger children couldn't enjoy it. Some parts of this attraction are bumpy and, in some instances, take place in the dark. Thunder Mountain is a FastPass+ attraction. Do it relatively early or late at night. Peter Pan’s Flight has some of the longest lines in the park, and unless you use a FastPass+ on it or arrive right at park opening (or jump in line right before park close), you might consider skipping Peter Pan’s Flight. It’s iconic because it takes guests in “flying” ships above London and Neverland. It has a few small dips, but it's slowly paced, so people of all ages can enjoy this ride. The new interactive queue added last year does help, making the long wait in line (if you have to wait) more bearable. This ride is indoors, so if it's a hot day, this short ride will give you a little respite from the heat. There is no better way to close a day in the Magic Kingdom than with fireworks. The new fireworks show is called Happily Ever After, which replaced Wishes. This is one of the best fireworks shows Disney has ever done. Do not miss it. The best place to view the show is anywhere along Main Street that has a clear view of Cinderella's Castle. You will see the fireworks exploding behind Cinderella Castle. The fireworks show is very popular, so you stake out your viewing spot at least 45 minutes in advance.